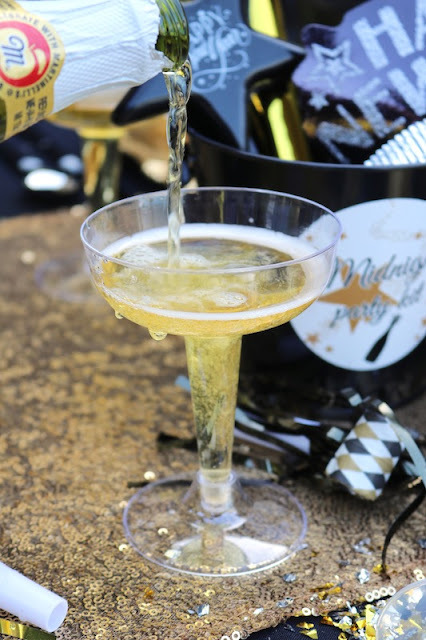 Cheers to the new year as we welcome 2018! I'm so ready to celebrate another year with a festive party alongside friends and family. Do you enjoy a BIG party, or would you rather stay in? 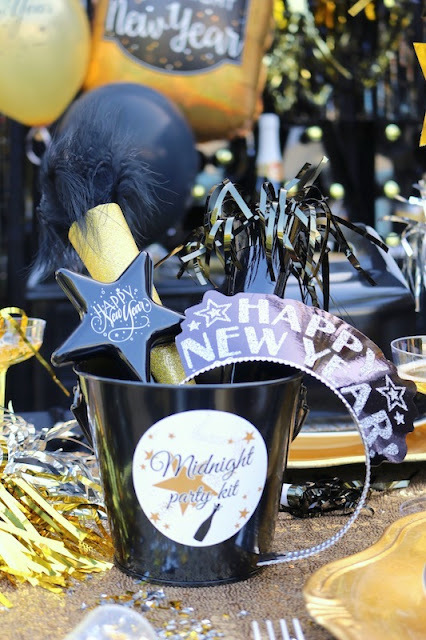 However you celebrate, we have some festive ideas that will have you saying, 'Happy New Year'! 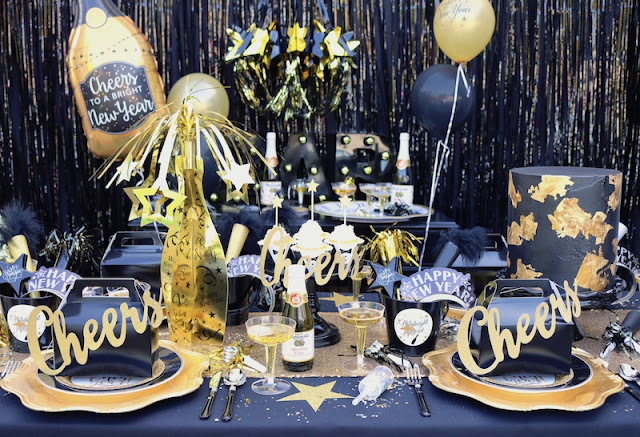 Set the party vibe by creating a fun party atmosphere! 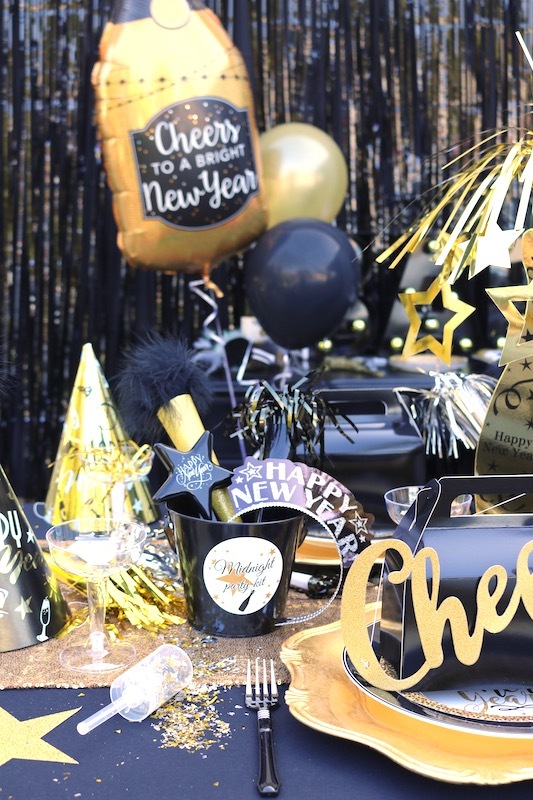 It's a lot easier than you think and Shindigz has a great selection of NYE decor! 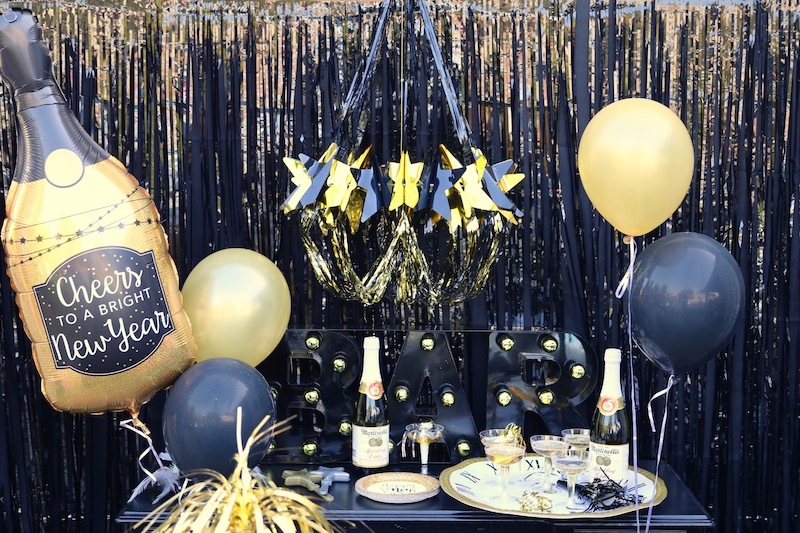 Start by hanging a black metallic curtain where you'll be setting up your main party table. 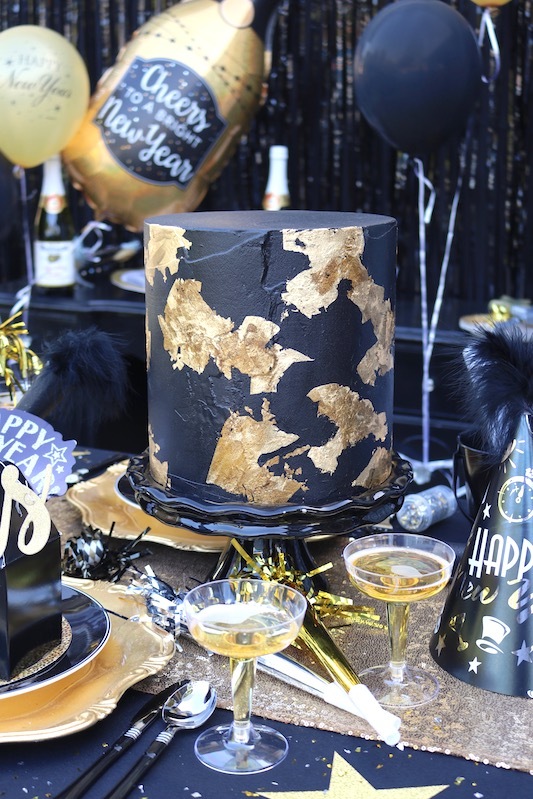 For a more solid look, attach some flat black paper or a plastic table cover behind the metallic curtain. This limits any of your wall showing through the curtain. Elevate your party decor with a black and gold chandelier! It is easy to assemble and adds so much shimmer to your party area. 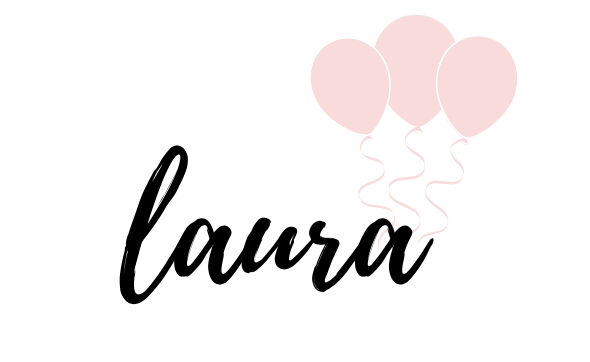 Don't forget the balloons! 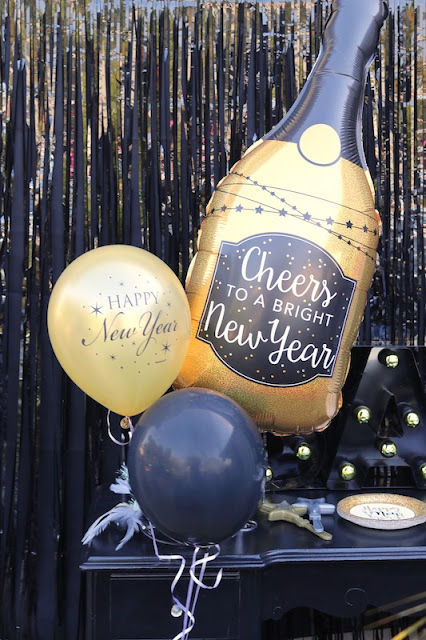 Add a champagne bottle balloon, along with a few solid black balloons and some 'Happy New Year' balloons! 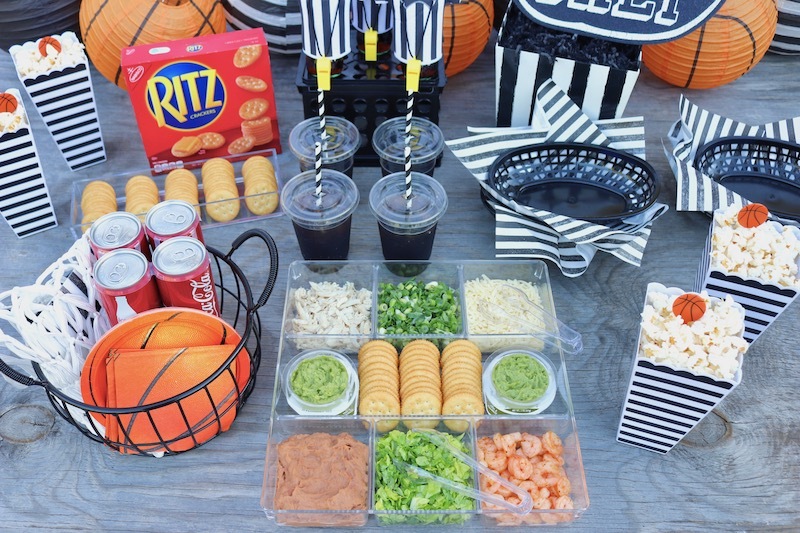 Create a party table that will make your guests feel welcomed! 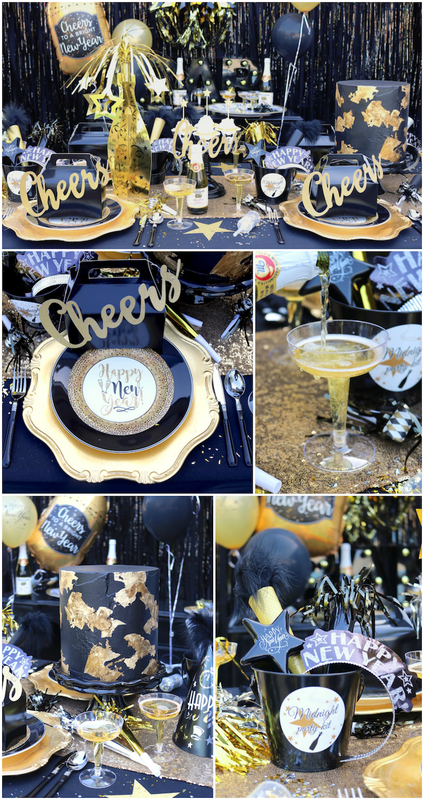 I love to see my guests happy and enjoying themselves so I try to make my party table fun and inviting. 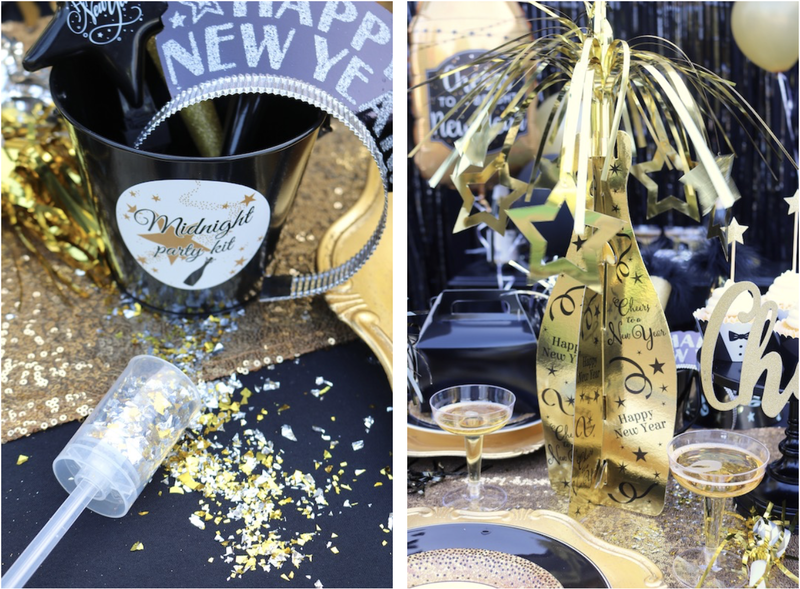 Add shimmer and shine with a sparkly gold sequin table runner! 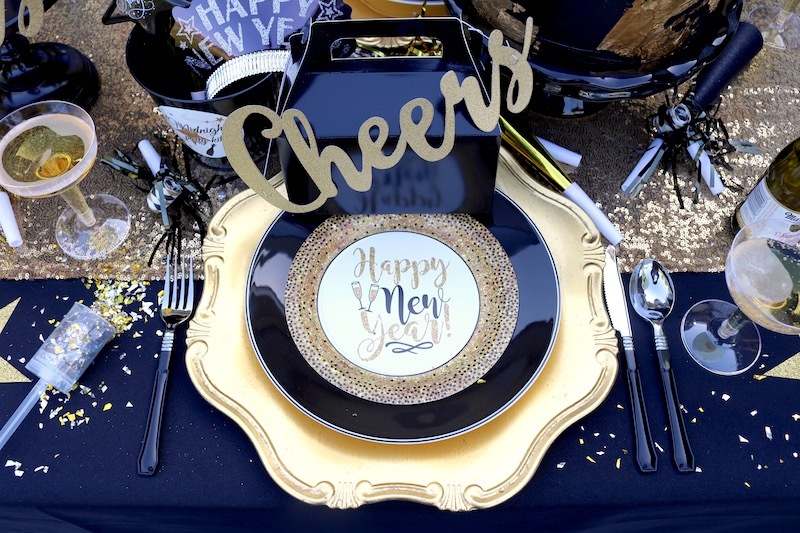 Set out gold glitter dessert plates, plastic utensils and champagne glasses that are perfect for that New Year's toast! 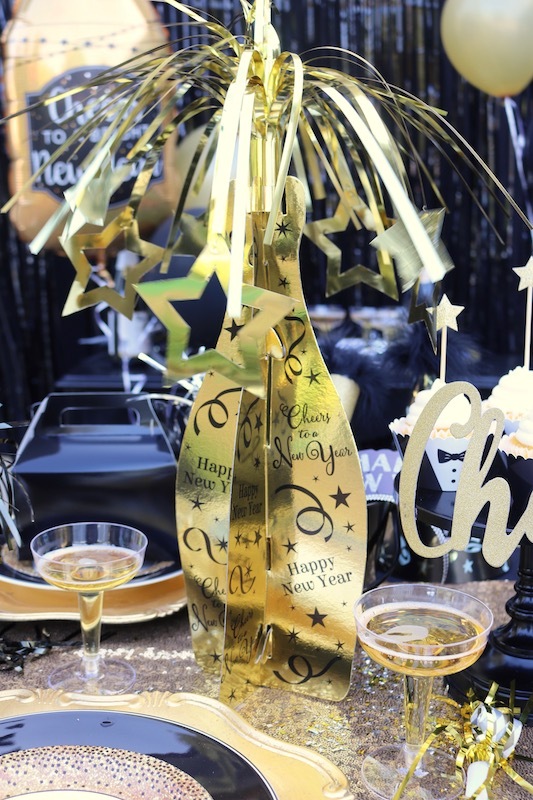 Toss a little confetti with confetti push poppers and a set out a festive champagne bottle centerpiece. 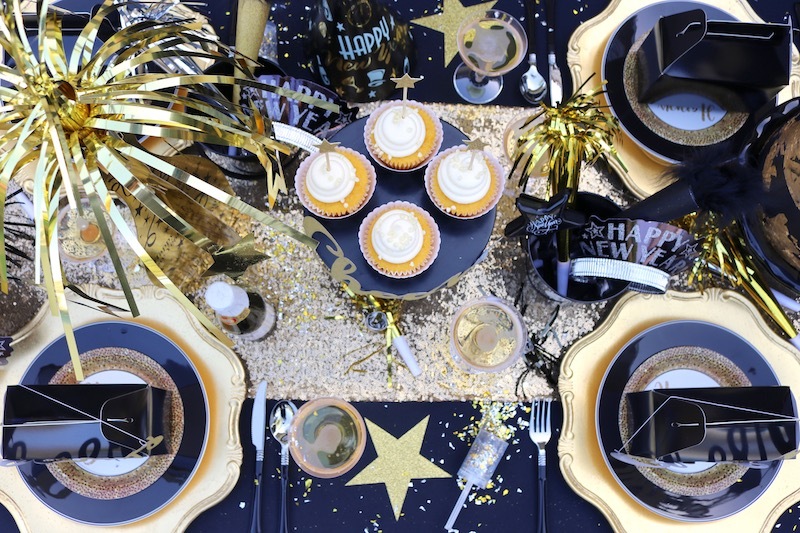 Make the most out of our NYE wearables and noisemakers by doubling them as table decor! Display NYE party hats, horns and other noisemakers on your table. 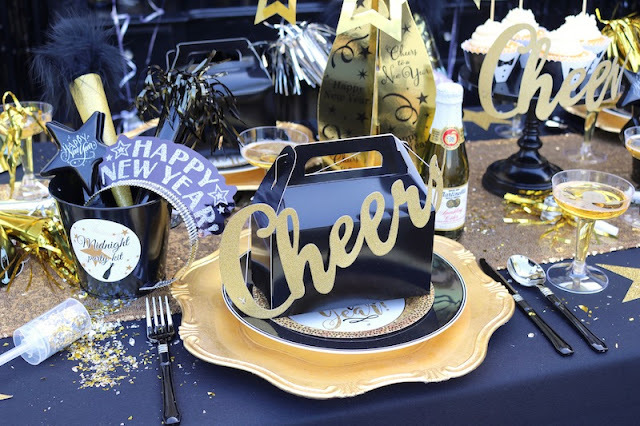 Take a New Year's noisemakers value pack and distribute some of the items across your table - it's that easy! 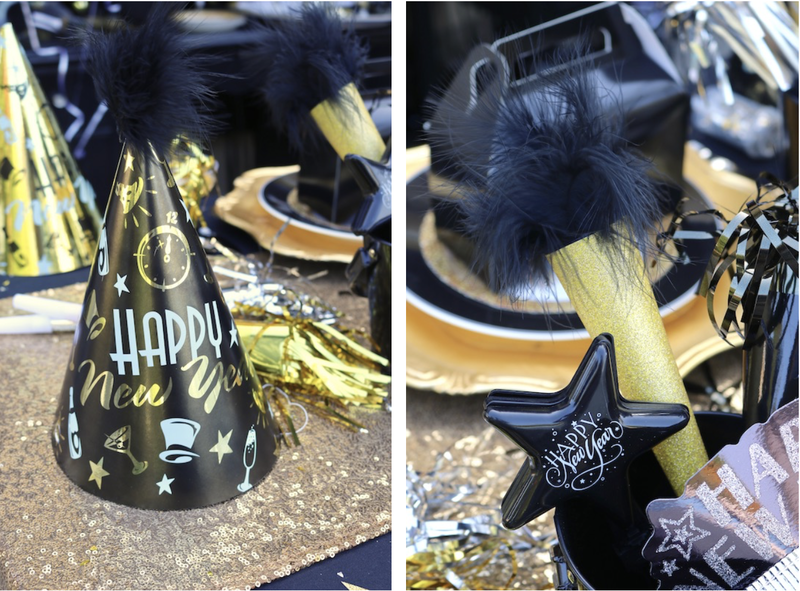 Take party hats from the elegant evening party kit and add a feathery touch with some craft feathers. You can also add some feathers to your glitter party horns! More noisemakers and tiaras can be added to a black tin pail for a quick and festive party favor! Add personalized stickers that say: 'Midnight Party Kit' to finish off your party in a pail! 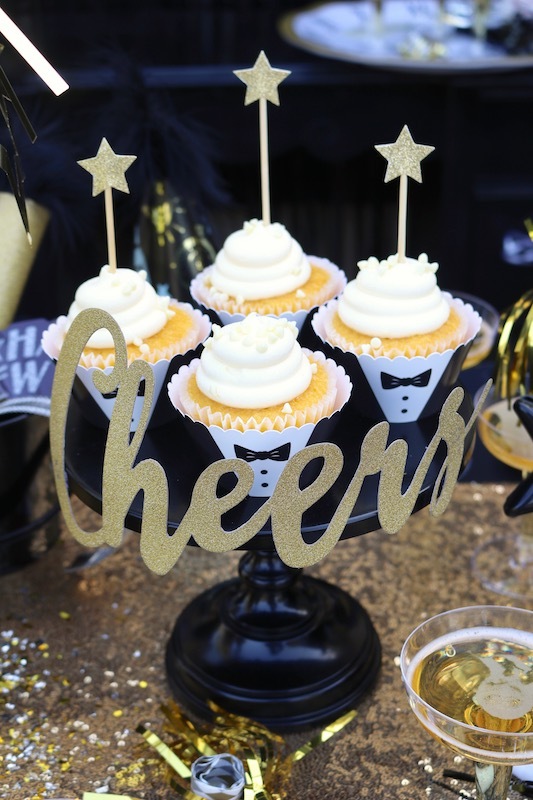 Party clothes aren't just for you and your guests, dress up your cupcakes for the occasion! Tuxedo cupcake wrappers are the perfect touch. 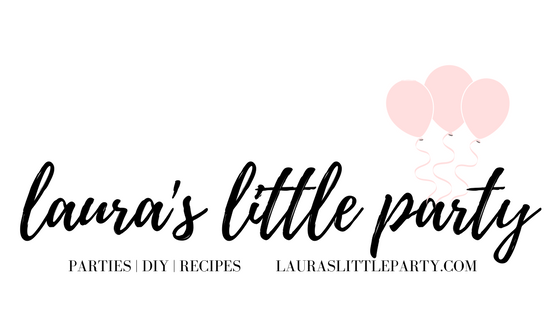 Top the cupcakes with a star swizzle stick! 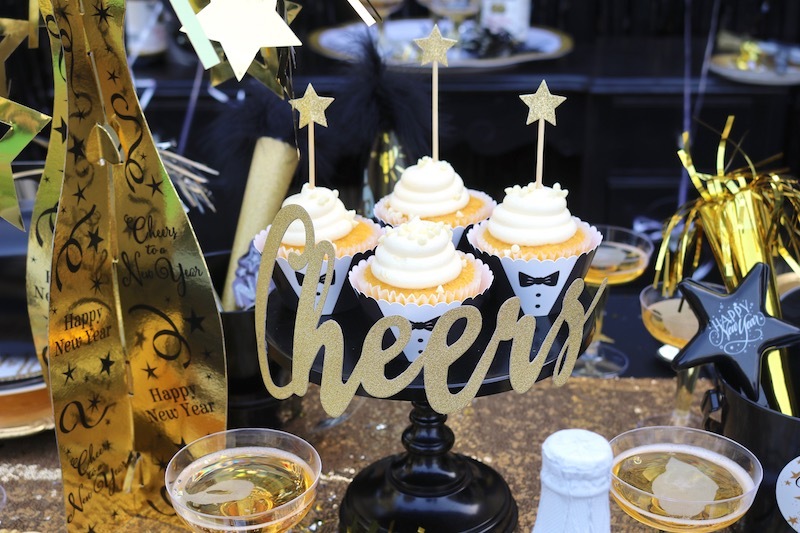 Set them out on a mini dessert stand and embellish it with a gold glitter cheers headband. Not only do the headbands add a festive touch to your table and favor boxes, they're easy to grab for those spur-of-the-moment photo opps! 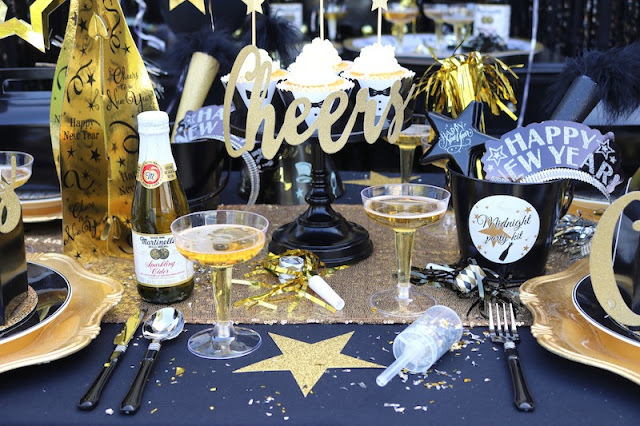 Are you ready to start planning your New Year's Eve party?! 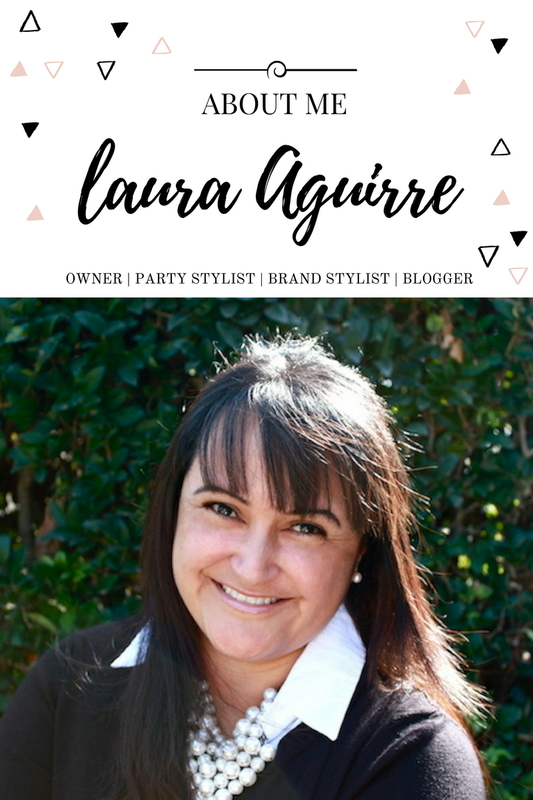 I hope my easy tips and festive ideas will make your party planning that much easier. 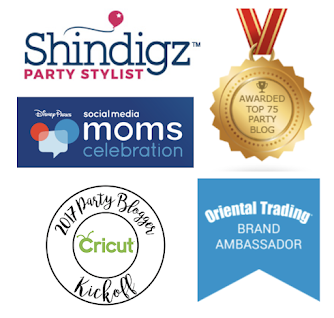 Head over to Shindigz and start shopping for your celebration. Cheers! Save this pin to your NYE board!